Yamabushi 1 year, 1 month ago. Android Nougat 7.1 ROM, LineageOS 14.1 for Galaxy S5 Docomo has now arrived via an UNOFFICIAL build. This Lineage 14.1 for Galaxy S5 Docomo (kltedcm) is brought to you by developer voidz-maguro (voidz777). – No donation link found for voidz-maguro. If you want some more Lineage ROMs or wanna taste the OFFICIAL Lineage build then stay tuned the Lineage OS 14.1 ROMs list page. Or, if you want the OFFICIAL LineageOS update or some latest Android Oreo ROMs then stay tuned to the Lineage OS 15 ROMs page or the AOSP Android Oreo devices list page. HAVE A BACKUP BEFORE FLASHING THIS AND TRY AT YOUR OWN RISK. Installing a custom ROM on a Galaxy S5 Docomo (kltedcm) requires the bootloader to be unlocked on the Galaxy S5 Docomo phone, which may VOID your warranty and may delete all your data. Before proceeding further you may consider backup all data on the phone. You are the only person doing changes to your phone and I cannot be held responsible for the mistakes done by you. – Here is theTWRP update guide for the Galaxy S5 Docomo. Download and Copy the GApps and Lineage OS 14.1 for Galaxy S5 Docomo ROM ZIP to your phone. First flash the Lineage OS 14.1 for Galaxy S5 Docomo ROM ZIP from device. Then flash the GApps zip from your device memory. – Here is a post explaining how to install LineageOS. Then reboot into recovery (don’t skip this) and flash the Lineage 14.1 Nougat GApps package. Reboot and Enjoy the Nougat 7.1 Lineage 14.1 ROM for Galaxy S5 Docomo. 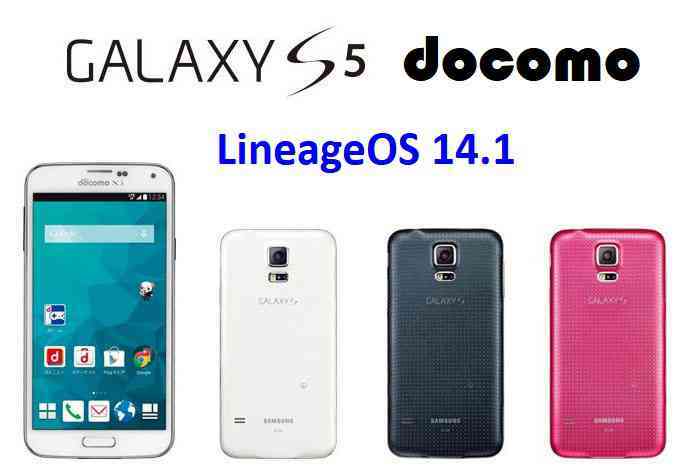 Copy the latest Lineage OS 14.1 for Galaxy S5 Docomo ROM ZIP file to your phone. Flash the latest LineageOS 14.1 ROM ZIP from your phone. Then flash the Lineage 14.1 Nougat GApps package. Stay tuned or Subscribe to the Galaxy S5 Docomo (kltedcm) forum For other Android Nougat ROMs, Lineage OS 14.1 ROMs, other ROMs and all other device specific topics. Thank you so much for this!! I had really started to give up all hope that my kltedcm was every going to see any newer versions of Android. Everything is working great with this release for me with one important exception. I am not able to get mobile/cellular data and LTE functioning. Any ideas for me? Other than that, it is running great! Thank you, again! As of now I did not find any development thread for this ROM. Will keep an eye on information regarding the issue you have stated. Meanwhile you can wait for some updates which may solve the issue. Thank you for the suggestion, but I’ve read about and tried that already, unfortunately a “no go”. Filling in a little background, after initially trying a number of things, I have most recently checked the APN and have set it to exactly what my wife has on her Docomo phone. Again, unfortunately no joy. I’ve also tried resetting all the network settings. Updated to “lineage-14.1-20171101_193940-UNOFFICIAL-kltedcm”, but no change, still no mobile/cellular data. Other than this critical issue, I love this ROM! Everything else is working perfectly. This almost certainly has to be a setting issue. Sorry to ask, but can someone please, walk me through step by step how I can troubleshoot and fix this? Preferred network type set to global or lte. Thank you, I’ve tried both of those and nearly every other Preferred Network type, but none have worked so far. It is a very interesting result. then finally turning on / off the airplane mode is fine. Yes, it’s the one very important thing that is spoiling what is otherwise the perfect ROM for me. OK, so I just was looking at your post and I see one difference. My “Baseband version” is different than yours. Mine is SC04FOMU1VNL5. That may be the issue? How do I change my Baseband version to what you have? BTW, are you in Tokyo by any chance? Thank you again for this ROM and all the help you are providing!